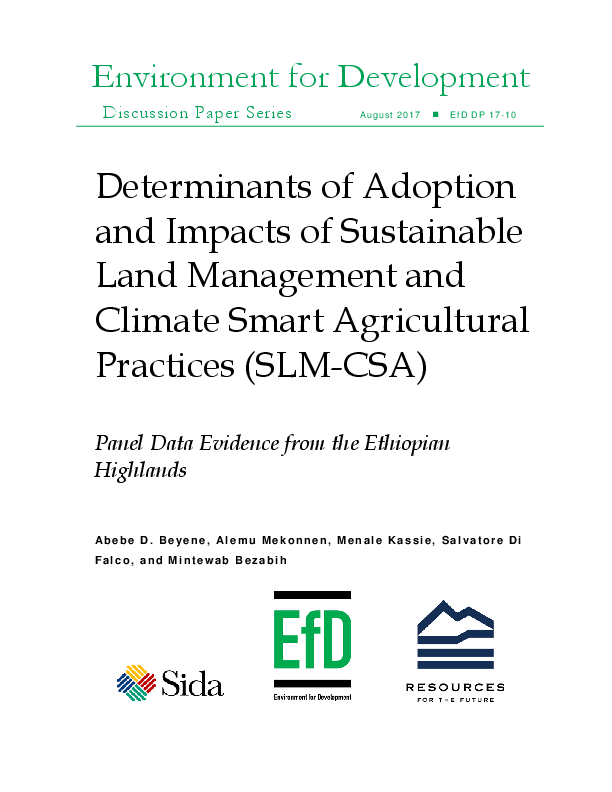 This paper analyzes the factors affecting adoption of sustainable land management and climate smart agricultural (SLM-CSA) practices (in particular tree planting, soil conservation and inter cropping)and the effects of adoption on crop net revenue. We use two rounds of household and parcel level survey data collected from the East Gojjam and South Wollo Zones in the Amhara region of Ethiopia, in combination with spatially explicit climate data (rainfall and temperature). We use a multinomial endogenous switching regression model to understand the impacts of SLM-CSA practices on crop net revenue and we conduct a counterfactual analysis to compare the returns from various adaptation strategies. The results show the importance of household characteristics, physical characteristics of the farm, and climate-related factors in farm households’ decisions to adopt adaptation strategies. We also find that the adoption of SLM-CSA practices, either in isolation or in combination, can result in both positive and negative returns in crop net revenue. Tree planting has the best payoff among the practices considered in this study, either in isolation or in combination. The study also suggests that adoption of all three SLM-CSA practices does not necessarily result in better returns compared to other strategies considered in this study.